For our second day in Barcelona we chose a tour called Gaudí’s Barcelona’, since we had been very impressed by Gaudi’s work on our previous visit. With all the adventure we’ve had on this cruise, this tour was still up there with the best of them. 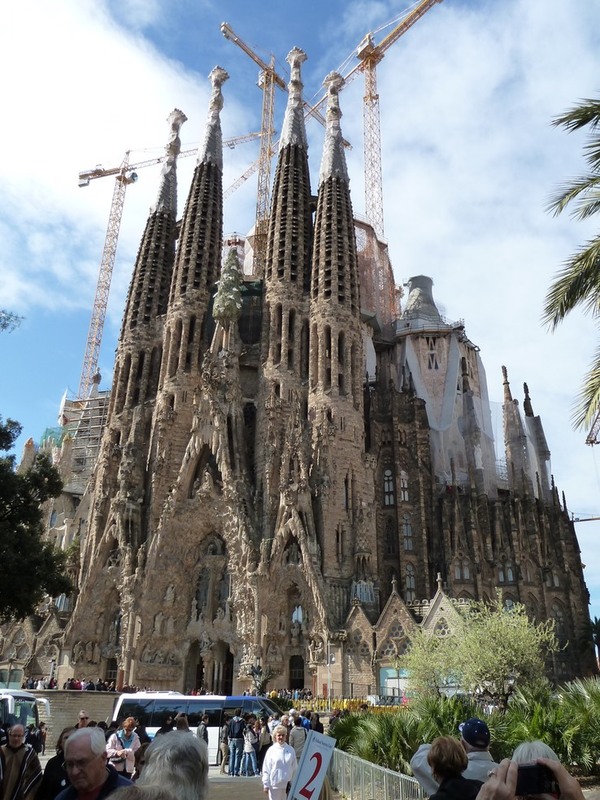 We had seen the exterior of Basilica de la Sagrada Familia before - both the nativity façade that was built by Gaudí, and the passion façade that was started after his death. The outside is impressive, but the inside was totally awe-inspiring. The style would best be described as an organic gothic. The columns spread out at the top like trees to hold up the ceiling. There is a lot of glass from Murano (Venice), Italy incorporated into the interior design. Multiple varieties of stone were used for the columns and floors. There is a double organ behind the altar. The church is still under construction. In 1882 work was started on the nativity façade, and 130 years later, the building still is not finished. The cathedral is built on a scale that is immense, with a very high ceiling, reminiscent of the gothic style, but very airy and open, and more natural. Traditional stained glass windows are being added at the lower levels. At the upper levels the windows are still leaded glass, but the designs are all done in clear and light gray glass, so as to let in the most light possible. Truly, the atmosphere of the cathedral would be destroyed if it were as dark inside as the old gothic cathedrals are. The church was officially blessed by the Pope in November, 2010. The people working on building the cathedral estimate that completion will take another 20 years. Part of that is due to the complexity of the designs, but part of it is due to the fact that they want to use only money from the people who visit, and no government funds. It has not always been easy to raise money that way. In addition there was a hiatus in the building for a period of thirty years surrounding the Spanish civil war. La Sagrada Familia was actually the last stop on our tour, but starting this post with our visit to it seemed to be the best way to go. The first thing we did on this tour was to drive by the Batlló House (pronounced baht-YOH). The only photo we have is, unfortunately, not very good. From there we drove to La Pedrera (pictured below), also known as Casa Milá, located on the corner of Passeig de Grácia and Carrer Provença. It is a beautiful, organic building which has shops on the ground floor and apartments on the upper floors, with a central courtyard. The flat roof is accessible by eight different stairways, and is a place where one can go to relax or have parties. The chimneys are typical of the Gaudi sculptured look, and they are part of what has made the house famous. The balconies have beautiful wrought-iron railings. With all its curves, the building seems to cry out to be touched. The sidewalk tiles around La Pedrera were designed by Gaudi, as were the lamp posts with mosaic benches in the area. We would love to visit again when we can visit the one flat that is open to the public, and check out the roof. That was not included in our tour this time. 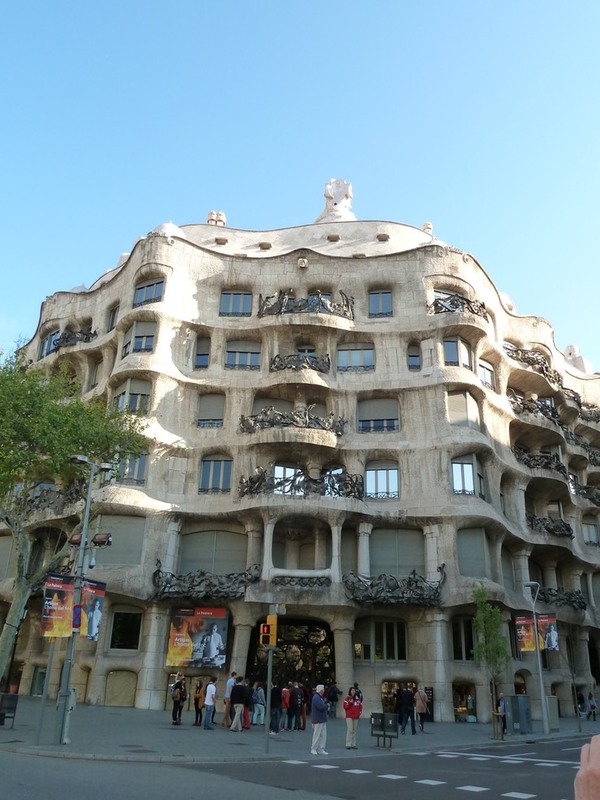 La Pedrera is gorgeous when you see it while driving by, but it is even more impressive up close. Our next stop was Park Güell, also designed by Gaudí. The park was originally envisioned as the center of a community of about 60 houses. The complete development never happened because the location was far away (at that time) from the main part of the city, and providing water would have been a problem. Eusebi Güell, the owner of the property also placed restrictive conditions on the sale of the home sites, so only three buildings were ever inhabited. The city is left with the beautiful park oasis and a couple of small houses at the main entrance to the park, the services pavilion and the porter’s pavilion, which look rather like gingerbread houses. The porter’s pavilion serves as the park’s information center, and has a chimney that is studded with coffee cups. The third house on the property is the one where Gaudí lived for the last 20 years of his life, and which is now a museum. The only thing in this house that was designed by Gaudí are the chimneys, which are immediately recognizable as Gaudí creations. At the top of the park is a cavalry sculpture, from which one can apparently get great views of the city. We did not make it to that part of the park, so we’ll have to visit again. There are several colonnaded walkways, which are under the viaducts that were designed to handle water. The best known of these is the washerwoman’s arcade. This one has slanted columns, one of which is a caryatid called ‘the washerwoman’, and places built in for planters. Most of the columns for the walkways look like trees, and the other walkways have holes built into them as places for pigeons to nest. The main path through the park has stone balls which represent rosary beads. This photo shows the Gaudí museum house and includes two of the rosary beads. The park is beautifully planted and maintained. There is always something to catch your eye, everywhere you look. The ‘piéce de résistance’ of the park is the plaza mayor, with its winding mosaic bench. The bench, despite being very hard, is quite comfortable. It is built with excellent back support. It is the work of Josep Maria Jujol, whose imaginative work allowed mosaics to reach their maximum expression. it is quite an expansive space. The plaza mejor sits atop a hypostyle hall with doric columns, the only place where Gaudí used classical style. This was to be the market place. The ceiling is covered with mosaic work (see examples below and below right). Everything in the park is designed to capture your imagination. The attention to detail is amazing. An example apart from all the mosaic work are the ‘drops of rain’ along the top edge of the hypostle hall, shown below. The places we visited today deserve more in-depth attention, and therefore another visit. We had admired Gaudí’s work on our earlier visit. This time we were completely blown away by it. Barcelona is one of the truly great cities of the world, and we would love to be able to spend more time there. If you seriously peruse only one photo album on this blog, this is THE ONE not to miss.